A college campus offers an ideal setting for exploring and practicing sustainability. Colleges and universities offer our best hope for raising awareness about the climate crisis and the dire threat it poses to the planet. They provide opportunities for both research and implementation; they have the capacity to engage students, staff, and faculty in collaborative enterprises that inspire campus transformation; they take the idea of legacy seriously. But most college and university administrations need guidance on the path to sustainability. 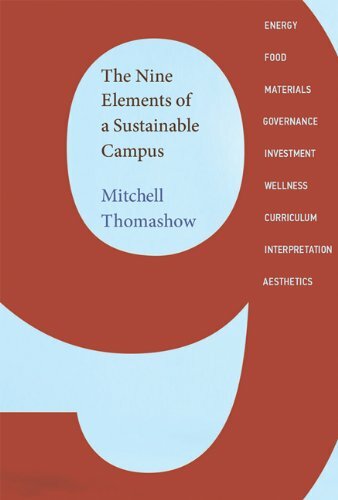 In The Nine Elements of a Sustainable Campus, Mitchell Thomashow, a former college president, provides just that. When Thomashow became president of Unity College, a small environment-focused college in Maine, in 2006, he decided to focus his leadership on sustainability. Drawing on his experiences at Unity, Thomashow identifies nine elements for organizing a sustainability agenda: energy, food, and materials (aspects of infrastructure); governance, investment, and wellness (aspects of community); and curriculum, interpretation, and aesthetics (aspects of learning). Thomashow describes, among other things, how Unity built the first platinum LEED-certified college president's residence in North America; installed solar panels, wind turbines, and other renewable energy generators all over the campus; became a center for local food growing; reconsidered the college's capital assets and investment strategy in light of sustainability; revitalized the curriculum; and made the entire campus a canvas for sustainability-inspired public art. Connecting his experiences to broader concerns, Thomashow links the campus to the planet, reminding us that local efforts, taken together, can have a global impact. This book shows how to make global environmental problems more tangible, so that they become an integral part of everyday awareness. At its core is a simple assumption: that the best way to learn to perceive the biosphere is to pay close attention to our immediate surroundings. Through local natural history observations, imagination and memory, and spiritual contemplation, we develop a place-based environmental view that can be expanded to encompass the biosphere. Interweaving global change science, personal narrative, and commentary on a wide range of scientific and literary works, the book explores both the ecological and existential aspects of urgent issues such as the loss of biodiversity and global climate change. 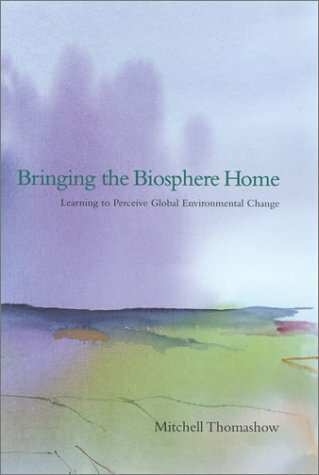 Written in a warm, engaging style, Bringing the Biosphere Home considers the perceptual connections between the local and global, how the ecological news of the community is of interest to the world, and how the global movement of people, species, and weather systems affects the local community. It shows how global environmental change can become the province of numerous educational initiatives—from the classroom to the Internet, from community forums to international conferences, from the backyard to the biosphere. It explains important scientific concepts in clear, nontechnical language and provides dozens of ideas for learning how to practice biospheric perception. Mitchell Thomashow, a preeminent educator, shows how environmental studies can be taught from different perspective, one that is deeply informed by personal reflection. Through theoretical discussion as well as hands-on participatory learning approaches, Thomashow provides concerned citizens, teachers, and students with the tools needed to become reflective environmentalists. What do I know about the place where I live? Where do things come from? How do I connect to the earth? What is my purpose as a human being? These are the questions that Thomashow identifies as being at the heart of environmental education. Developing a profound sense of oneself in relationship to natural and social ecosystems is necessary grounding for the difficult work of environmental advocacy. 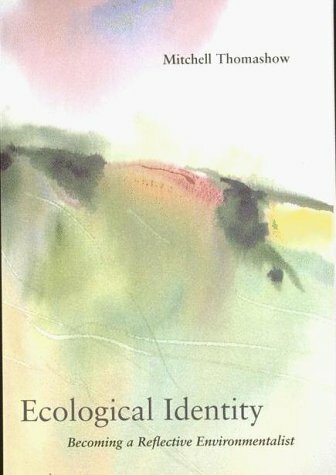 In this book he provides a clear and accessible guide to the learning experiences that accompany the construction of an "ecological identity": using the direct experience of nature as a framework for personal decisions, professional choices, political action, and spiritual inquiry. Ecological Identity covers the different types of environmental thought and activism (using John Muir, Henry David Thoreau, and Rachel Carson as environmental archetypes, but branching out into ecofeminism and bioregionalism), issues of personal property and consumption, political identity and citizenship, and integrating ecological identity work into environmental studies programs. Each chapter has accompanying learning activities such as the Sense of Place Map, a Community Network Map, and the Political Genogram, most of which can be carried out on an individual basis. Although people from diverse backgrounds become environmental activists and enroll in environmental studies programs, they are rarely encouraged to examine their own history, motivations, and aspirations. Thomashow's approach is to reveal the depth of personal experience that underlies contemporary environmentalism and to explore, interpret, and nurture the learning spaces made possible when people are moved to contemplate their experience of nature.